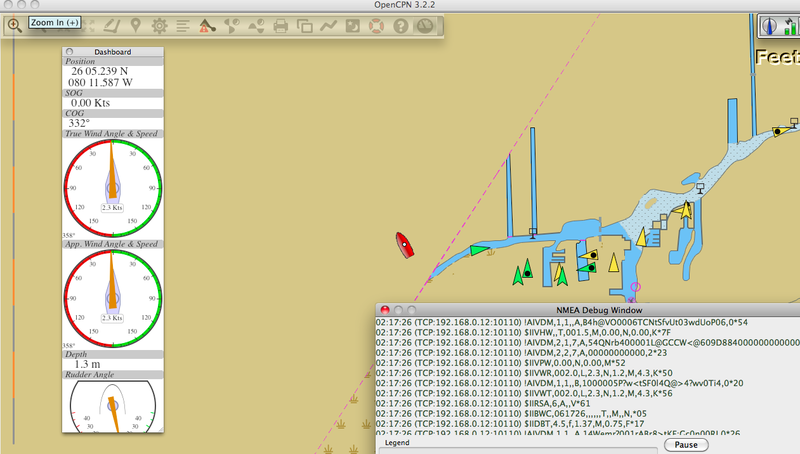 Trying to use OpenCPN to put my NMEA stream(s) onto TCP to use with iOnboard app and other instruments. I've hit a roadblock. Here is my config. 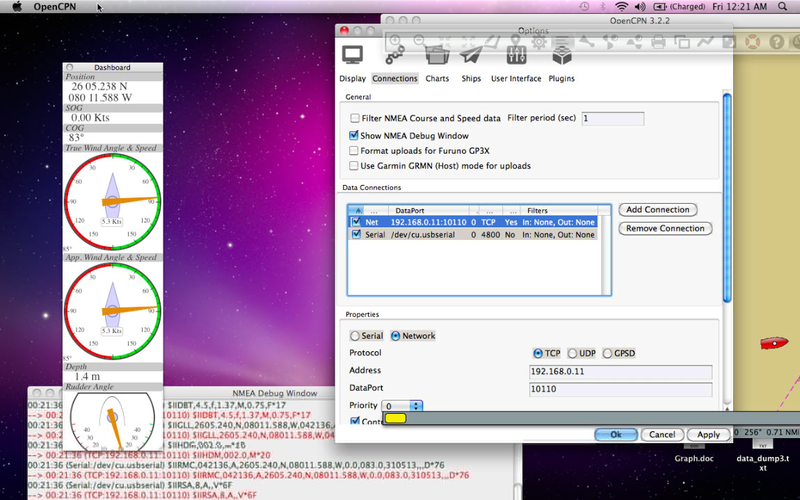 (2) Incoming NMEA at 38400 for AIS from the ICOM receive only box directly. (3) Outgoing TCP stream on the IP address of the machine. On UDP it seems to be blue for transmitting...but I cannot use that. What steps can I use to diagnose what is going on here? Once you connect to that port with a client, it should turn blue. UDP protocol in contrary does not care about the client and just broadcasts. You should be able to test it even on Mac using telnet as on the attached screenshot. 1) Is telnet the only client that can access. Snow Leopard seems to disable remote telnet access and its near impossible to reenable it seems. 2) Would blocking of telnet prevent other remote apps to connect to this stream? I cannot get OpenCPN installed on a different Mac to pick up the TCP stream either. ad 1) What SL probably disabled is a telnet server it maybe contains, which if it was running at all, would be listening on TCP port 23 - good thing, but completely unrelated to what we do here. ad 2) No, it has nothing to do with our use of port 10110. BUT maybe Mac blocks access to all ports by default - I have no idea as I never used one. What I did is I used a telnet client (as it was the first program able to open a TCP port and show what it gets from it that came to my mind and there's high chance it's available on OS X) to connect to opencpn running as a server on port 10110 on the same machine. But to simulate your case I used it's real network interface address so in fact it was the same as if I did it from a different machine (in case the access would not be blocked by a firewall of course). Ok, I did understand you properly, but I'm taking a very elementary approach here just to make sure I get it right. Please see the following screen shots. Despite enabling telnet in launchctl, I still get connections refused. Thank you for your assistance. Again, thank you for your help. I'm flumoxed. I've checked my router to make sure no filtering is happening. I've enabled telnet in launchctl so you'll noticed that remote connections are being made WHEN I dont include the port for OpenCPN TCP. My next step is to flip this around and see if this all works on my Mountain Lion Macbook vs my Snow Leopard Macbook. But thats going to have to wait till the weekend as its already past midnight here and itll look weird making trips back/forth/back/forth to the boat even if its in my back yard. Ok, tried it the reverse setup...doesn't work either. What gives?!?! 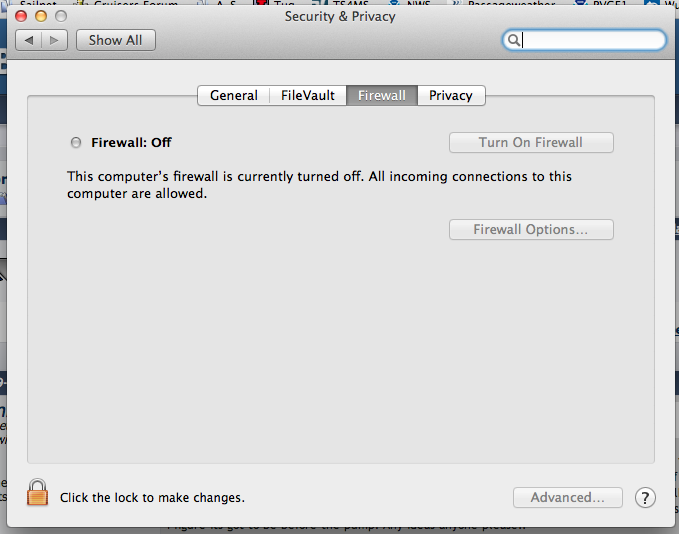 Are you really sure that the OS X firewall is not simply blocking the incoming connections? I'm fairly sure about the address. It was the result of an "ifconfig | grep 192." command (my DSL Modem router gives 192 addresses...it is a Netgear N300). As for testing localhost connection with Telnet, that was to validate that the telnet daemon was turned *ON* be placing entry into launchctl. Weird stuff. After placing the entry for telnet in launchctl, i'm able to telnet to the standard port (22)...but never to 10110. Now notice how I scanned a much more defined range where the port for 10110 should have triggered an open port report. At this point, I feel there is a bug in OpenCPN for Mac in 3.2.2 Can anyone else repro? I think there is *DEFINITELY* a bug. I was even able to run 3 TCP servers on the VM (on ports 10110, 10111, 10113) in order to have opencpn on mac, iAIS on ipad, and iOnboard on android phone all display instrumentation. Gosh, this is KILLER. I just need it to work native on the mac to save on the battery juice. Parallels running on this macbook *HOGS* up amps. Can someone please look into this bug soon! !